Lahiki O Ka Hale (House of the Rising Sun) Perto do oceano! Venha para Lahiki O Ka Hale (casa do sol nascente) e desfrutar de suas férias nesta espaçoso, confortável e decoração colorida casa. Nossa casa está localizada no bairro altamente desejável Hawaiian Paradise Park, no lado leste da Ilha Grande. A casa inteira, no andar de cima e para baixo, tem piso cerâmico. O enorme va selecionados é um ótimo lugar para jantar e relaxar após um longo dia de visitas. Lahiki O Ka Hale vai dormir até aos 15 anos. Duas camas queen size estão lá em cima. Um sofá-cama queen na sala e uma cama de solteiro tamanho do dia poderia ser usado na varanda para dormir. Uma rainha, dois gêmeos estão em quartos e dois sofás de estilo futon que se dobram em duas camas individuais estão localizados na sala de estar principal, no andar térreo! Permanece de férias por dia feriado será $ 50. Com uma localização central, no lado leste da Ilha Grande, Lahiki O Ka Hale está a apenas 20 minutos de carro de Hilo cidade ou a 10 minutos de carro da vila velha pitoresca de Pahoa. Esta casa está localizada a poucas quadras do Oceano Pacífico é o local perfeito para detonar a partir de todos os pontos turísticos e sons do passado do antigo Havaí, Hilo e do distrito de Puna. Você é apenas uma movimentação de 40 minutos para o Parque Nacional do vulcão. A área de Kapoho, com suas maravilhosas piscinas e snorkeling pontos, fica apenas a 25 minutos de carro. As piscinas naturais Waiopae têm alguns dos melhores snorkeling na Grande Ilha. Qualquer estadias superiores a 2 semanas o locatário é responsável pelo restante da conta de energia elétrica para completar a sua estadia. The property is in a good location and we have stayed there several times over the years. Older, but great for groups. Very comfortable. Home was perfectly set up for our family’s stay, clean and well maintained home allowed for a stress free vacation. This house was amazing! !The location ,the set up,the environment that it's in ,is a great place you can call home after an adventurous day on the Big Island!! !We loved the Lanai,as that was where we spent most of our evening's at,listening to the ocean waves ( 3 blocks away),,Nothing bad I can say about this house other than we were and to leave,but i would definitely recommend it to everyone! !Thank you for having my Family of 10 call your house our Hawaii home for 2 weeks!!! Thank you!! So glad it worked out. Scary times on the island. This property is an excellent value. Our group of 8 enjoyed lounging and eating on the lanai. We had room to spread out and enjoyed making meals in the kitchen. We also enjoyed daily walks to the coast to watch the sunrise, explore tide pools, and watch the night sky. We spent most days away from the house for our activities but enjoyed the quiet neighborhood each evening. Thank you for sharing your home with us it was an enjoyable stay. 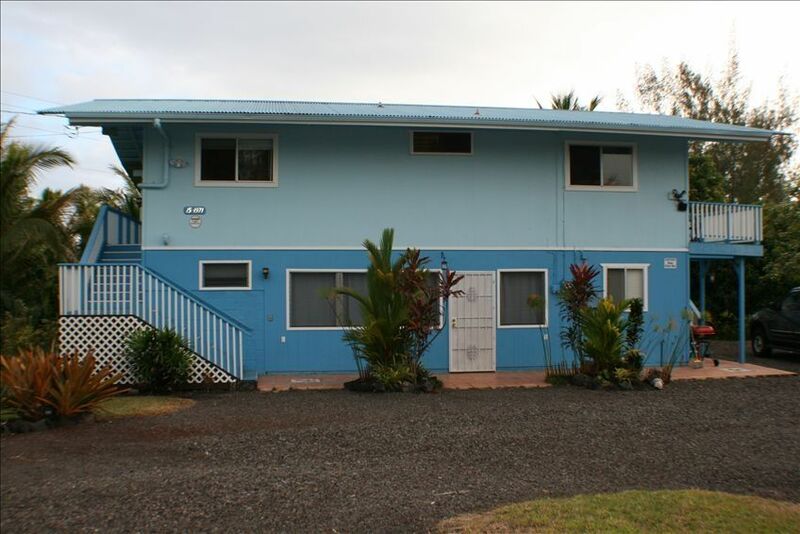 I rent a lot on VRBO and though this house was not as aesthetically or beautiful as some of the others I have rented in Hilo it felt so safe which I would trade any day especially in Puna. This is the 2nd house I rented in Puna that feels like angels protect it. The other house that I felt safe at was just down the road so I am going to research that Wahi pana to see what it once was. It was awesome for what we paid for it... Our thanks to you again... We will be back! A $200 damage deposit is required at time of booking, and refunded after check out inspection, or left up to owner's discretion of any quantity to be returned, minus fees and or troubles. Any people over the age of TWO (2) years old, that exceeds the limit of EIGHT (8) renters for whole house will be charged a per person/ per day fee of $15. $100 water usage fee is per week for 8 or more people. ANY STAYS LONGER THAN 2 WEEKS WILL BE RESPONSIBLE FOR THE ELECTRIC BILL.